Speaking of Sun Ra, as I convert my jazz LPs to digital, including my Sun Ra LPs, I think my favorite is Live at Montreux... great band, great sound, great performance. Maybe his best before he sank into more formulaic performances at the end of his career. Live at Montreux is an excellent performance which covers the Arkestra between free jazz and Ellington quite well. There are less electronic distractions, Ra rather focuses on piano. 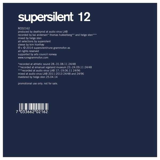 Of course, Supersilent are more interested in his electronic excursions.